(Boston, MA) – BOND, the Northeast’s premier building, civil, utility and energy construction firm, recently celebrated the completion of Bristol Community College’s John J. Sbrega Health and Science Building. 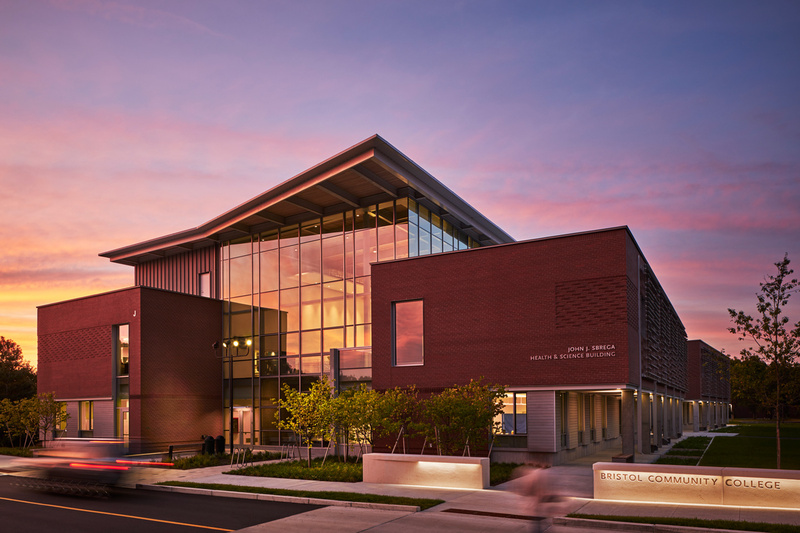 Located at BCC’s main campus in Fall River, Massachusetts, the 50,600 SF, LEED Platinum certified facility is the largest Zero Net Energy (ZNE) classroom and science laboratory building in the Northeast. Its unique design allows the building to produce enough renewable energy to sustain itself at zero cost to the campus. The new state-of-the-art building provides a community hub of healthcare and science training to educate students in the high-demand fields of nursing, dental hygiene and life sciences. These programs are well aligned with significant job opportunities and career advancement in local industries. The building features two stories of teaching laboratories, community spaces and interactive classrooms, joined by a central atrium. ZNE is a monumental achievement for any building, but especially one that houses a large amount of energy-consuming laboratory space. To offset the facility’s energy consumption, the team installed geothermal wells that feed a ground source heat pump. This was coupled with an air source heat pump to provide heating and cooling to the building. In addition, 12 of the building’s 16 fume hoods filter and return air to the space, rather than exhausting it out into the atmosphere. Lastly, a photovoltaic array, built by others adjacent to the facility, will work in conjunction with the building’s own roof photovoltaic array. This system provides power to the building and serves as a shading structure. The building was completed in time for the Fall 2016 academic school year. A ribbon cutting ceremony was attended by BCC, BOND and the design team which included Sasaki Associates and Bard Rao + Athanas (BR+A).